Hello Bushwhackers, welcome to a new project I am working on titled State of Alberta’s Trout, where I will examine and discuss the current state of our trout ecosystems, the current threats that these species face, as well as what we as Anglers can do from a conservation perspective. This entire idea really stemmed from a blog post I made last year, titled The Cringeworthy History of Alberta’s fisheries- And how we are barely hanging on, in which I reviewed an academic article discussing the astounding degradation of Alberta’s fisheries over the past decades. If you didn’t read it, go check it out. What was discussed, in essence, is how fickle and dynamic the trout environment is, and how easily that balance can be thrown off, and how much it has been thrown off, all over the province. This pinballed into me spending last summer really analyzing the river on a deeper level, trying to figure out what was going on, and moreso WHY it was going that way. I began to think about what I could do to help protect these ecosystems, beyond the standard set of practices most of us follow like Catch and Release, proper handling, pinching barbs, ect. 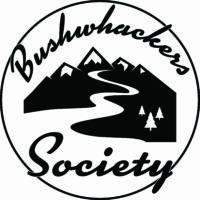 I decided that I would use the Bushwhackers Society Blog as my megaphone, and try to spread the word of conservation and environmental stewardship to as many people as possible. So I began to research, sifting through Government issued SRD reports, historical data, and whatever else I could find on the interweb, and matched that with the observations I have made personally while pursuing trout, and compiled that into a short report, which I hope will accomplish 3 things . 1) Shed light on the severity of Trout degradation in Alberta (USING FACTS), and the need for immediate action/ participation, 2) Share interesting and relevant information that people might not know about the Trout that occupy Alberta’s freshwater streams, and 3) Provide anglers with a framework on how to minimize their negative impact on fish and contribute to conservation efforts. So with that being said, I highly encourage you to share this, as the more people who read this the better! I believe that we need a mentality change in Alberta, and that starts with education and holding people accountable. And if Fish and Wildlife doesn’t care whether you know the Regs, or can properly identify a fish, then I think its time the community takes matters into its own hands and start demanding that people do. Because if you fish in Alberta, you have a vested interest in keeping these populations healthy! Finally, thank you to everyone from the Bushwhackers community who shared their photos for this post! Last thing before we dive into Bull Trout. Most of the data and observations in this report are from Academic sources, Government conducted surveys, and Scientific papers, which all use very dense, scientific language that might not make any sense to the average fisherman. I have tried to simplify the language to make it more approachable, and have summarized data so it makes sense for you, however, info contained is my personal language and not necessarily the language used in the source. Can you identify the Bull Trout in the above photo in real life? 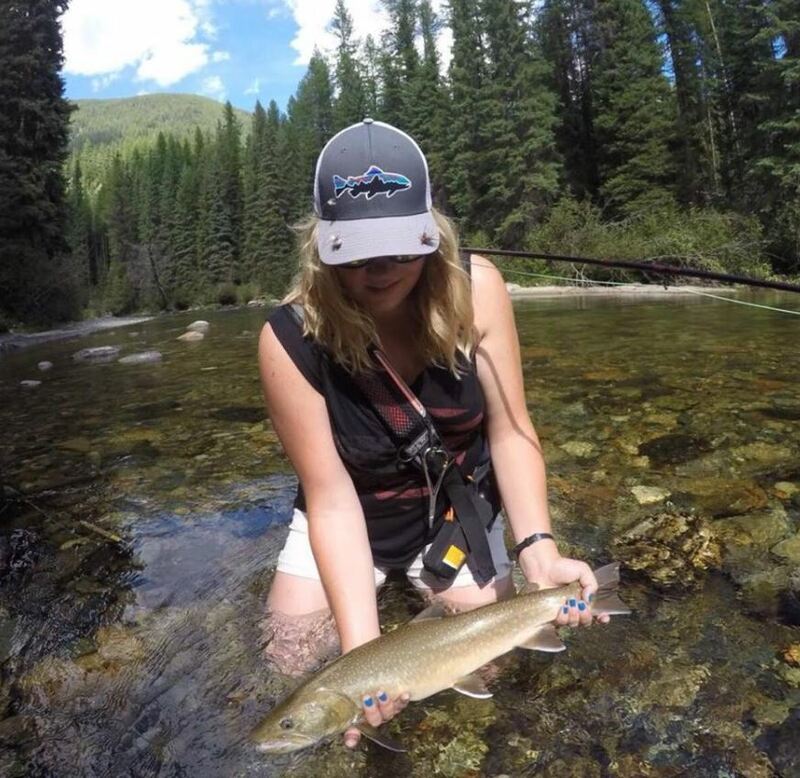 Do you know that the Bull Trout is the provincial fish of Alberta, and that they are strictly catch and release throughout the entire province of Alberta? Did you know that despite C & R regulations, Bull Trout populations are still critically endangered, and just a mere shade of what they once were? Unfortunately, there are too many people in this province that answer no to some or all the above questions. Case and point: In a 2004 census, only 50 % of licensed fisherman in Alberta could properly identify the Bull Trout. Yes, that was 14 years ago. And yes, it may have risen; but it is still a problem. I have had several personal experiences of people mistaking the Bull trout for Brooks, using bait, and seen people keeping them. For a long time, Bull Trout were regarded with indifference in Alberta, the species of least concern, off the public radar, until quite recently. Beginning with the implementation of C & R regulations on all Bull Trout 25 years ago, people slowly started to realize what a great sport fish the Bull Trout was, and what amazing opportunities we had here in Alberta. And now, with the fish media overload that is our social media pages, the word of Trophy Bull Trout fishing in our corner of the world is definitely out, and the fishing pressure on our Bulls is greater than ever. But do all these hopeful fisherman going out for Monster Bull Trout Glory know that they are still highly endangered? Very susceptible to human and environmental impacts? Already facing local extinction in many places across the province? And just because so many large trout are being caught, and the fish seem numerous upon first impression, does not necessarily mean these populations are healthy, or destined for longevity. But the reality is there is not enough resources being deployed to properly monitor Bull Trout populations, and the data we are using to inform decisions is based off of outdated data. That is how the ideas of this report are structured. The legit numerical data of the past vs. the uncertainty of what we presently dealing with; and what that might mean for Bull Trout Conservation going forward. In compiling this post, three primary sources were used. Most of the statistics and info contained are from the Alberta Sustainable Resource Development ‘2012-2018 Bull Trout Conservation management plan‘ (here-on referred to as SRD report). That report bases most of its inferences on population estimates and numerical data from 2005. There is more recent data available for the Upper Oldman system, taken from Bull Trout Population Assessment in the Upper Oldman River Drainage, 2009 (Upper Oldman Report), as well as quotes and figures taken from Lorne Fitch’s aforementioned Two Fish, One Fish, No fish , which uses many of the same outdated sources. Data from 2005 was only 10 years removed from the implementation of C & R regulations in Alberta. 14 years of C & R fishing have elapsed since then, which means things have likely changed significantly in that time; but is that change for the better, or for the worse? My simple answer to that question is both. I believe there is likely many populations that have made significant improvements in range and size, and may not be as threatened as they were 14 years ago. There are many rivers that show many signs of improvement, and likely have benefited greatly from a larger sample size of C & R regulations. On the contrary, there is likely a handful of populations that were just barely hanging on 14 years ago, that are now all but gone, or locally extinct (extirpated). The populations that live in Small creeks (Resident) fall primarily into this category. In 2005, there were dozens of Resident populations with less than 50 mature fish left (50 is considered the minimum viable population size). They were tetering on the edge; where any negative external factor had the potential to knock them out. Where they have hung on, and where they have perished I don’t know. All I know is that many of these streams our among my personal favorites, and some of the finest trout water around. So lets not miss our chance to preserve these excellent Bull Trout fisheries with resident populations. I do not intend for this to be a doomsday report, where I scare you with scary statistics and threaten the imminent extinction of Bull Trout. But the fact is, Bull Trout are threatened across the continent, and the populations in Alberta/ BC are some healthiest populations remaining. We have a little slice of Bull Trout heaven here that is all but gone almost everywhere else in the world. And we must be cognizant as a community about protecting this resource, and doing our part, and together ensure Alberta offers anglers from around the world a chance at trophy Bull Trout for generations to come. So keep reading. I believe there is takeaways to be had from this post for all types of anglers, and the more you know the better. There are 3 major sections in this post. What can you do as an Angler? We will begin by learning about the Bull Trout, their life cycle, and different types of populations. Bull Trout are a native species to all of Alberta’s freshwater streams, and used to be the most widespread of all fish in Alberta, historically occupying every freshwater system from the Castle all the way north to the Athabasca, and as far East as cities like Edmonton, Red Deer and Calgary. 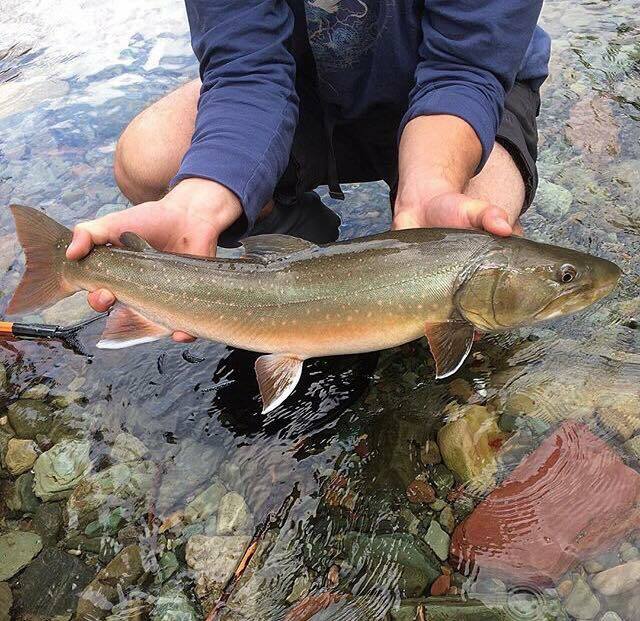 Bull Trout live in cold, mountain streams, usually in the most inviting, deep pools. Bull Trout grow very large, often in excess of 30”. 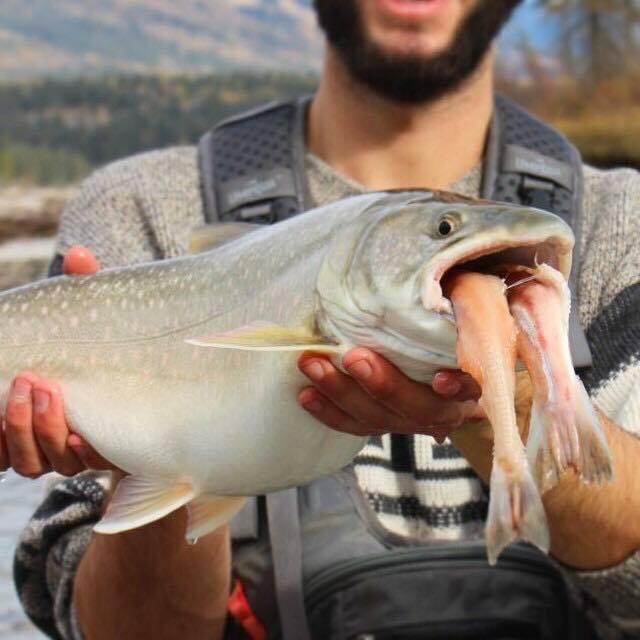 And Bull Trout are voracious eaters, devouring any meal they can clamp their jaws around. This made them easy to catch in the days of old, when catch and release was not a thing. Bull Trout Spawn in the Fall, usually late August – Early October, dependent on weather and stream temperatures. Bull Trout use small tributary streams to spawn and rear as juveniles. Bull Trout usually reach spawning maturity around 4-7 years old. They can live for a very long time, sometimes upwards of 20 years. Bull Trout can be identified by the lack of black markings on their fins, their pale greyish/green color, and the white slash on their fins. The SRD report indicates there are 3 types of Bull Trout Populations in Alberta: Stream Resident, Fluvial, and Adfluvial (live in lakes). We are going to focus on the first 2, Stream Resident, and Fluvial. Stream Resident Bulls are Bull Trout that permanently reside in small tributary streams and creeks. They spawn and rear as juveniles in the same stream and typically do not grow as large. Typically, these fish are not nearly as migratory and can be found in the same section of the stream for an entire season. Those long and skinny 16″-22″ Bulls found in smaller creeks are often Stream Resident (particularly if caught early in the season, before spawning fish have entered tributary). 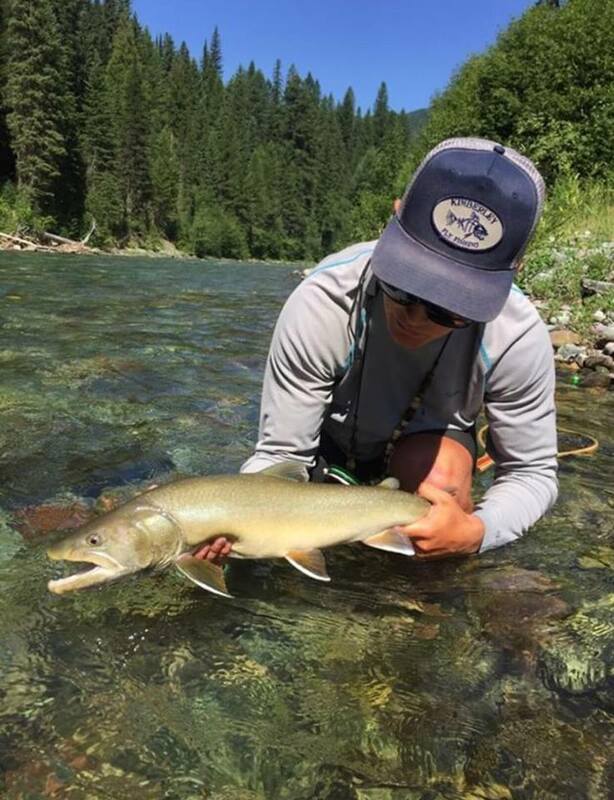 Fluvial Bull Trout are populations that occupy larger tributaries of major rivers or major rivers (think Highwood River, Sheep River, Oldman), and migrate to smaller tributaries as the summer progresses to spawn and rear as juveniles (which means the young fish will live in the trib. until they are larger/reached spawning maturity, at which point they will head to larger river). These populations can be highly migratory, sometimes having a home range of over 250 km. Fluvial Bull Trout grow much larger than Stream Resident Bull Trout. 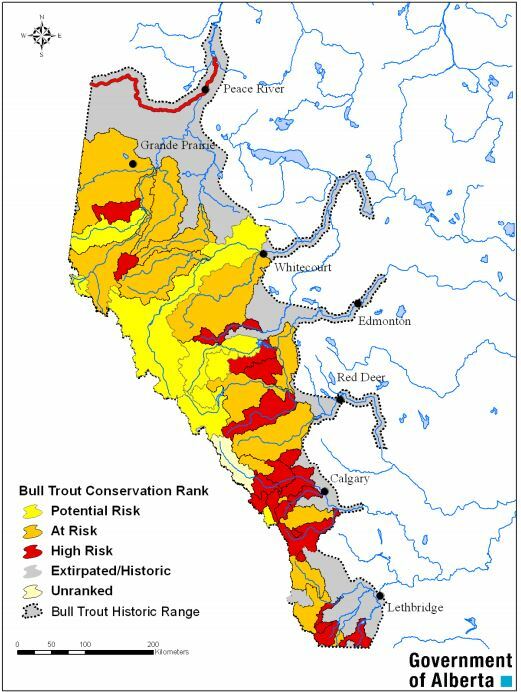 Almost all river systems in Alberta contain Fluvial Bull Trout Populations. Adfluvial Bull Trout are those that live in lakes. They will not be discussed throughout this report. Lake dwelling Bulls can grow to monstrous porportions. They are typically found in the Lake itself, however, they do move into river channels and feeder streams to spawn in the Fall. They face similar challenges and are still C & R only. Understanding the different types of populations can help us catch fish, by knowing where there might be a Resident Bull population or whether it is just juveniles, or to understand whether Fluvial populations might be likely to be in the main stem of the river or in the tributaries, based on the time of the year. Knowing Fluvial Bull Trout only move into tributary streams to spawn means most small creeks will not have many Big Bull Trout outside of spawning season. A juvenile Bull Trout from small trib. While not as impessive as a mature Bull, these little guys are eager and easy to catch, and can be a great way to learn to fly fish. JUST PINCH YOUR BARBS, as their small mouths and tough jaws can make getting the hook out very tricky! Say you were fishing a small stream at a time (June-July) that was not during the Bull Trout spawn, and you catch a significant Bull Trout, 20″ or upwards that appears to be of spawning age (size of the head and jaw are good indicators of age, so often a trout whose head looks to big for it’s body) . You would likely be looking at a Stream Resident Bull Trout. If you found yourself catching plenty of small bulls (less than 14″-16″), but nothing big, then you could infer that that this particular stream is probably a spawning ground, and what your are catching is juvenile fish less than 4-5 years old spending their youth in the more accommodating tributary stream (these fish probably have a more pale white color, with less depth and brilliance, and a small head/jaw that makes them look, and feel smaller, than their length). In reality, you would (or rather, should) encounter both- the smaller pools and unassuming lies providing smaller Juveniles, and the deep, obvious honey holes granting the odd Big Bull, that just looks, acts and feels different then the ones caught before. However, in Alberta, there are cases of local extinction of Fluvial populations (Bow River), which puts any Stream resident populations at a much higher risk, and stream resident populations are in trouble pretty much across the board, which puts the Fluvial poulation at risk. Why? Ideally, these populations are co-existing in the same streams, while still having a small amount of genetic interaction between them. This slight interaction helps both types of populations avoid local extiction (by disease, natural disaster, weather). If something happens that affects one population, it will be able to recover by drawing from the other, and vice versa. Essentially, extinction of one population means bad news for any other populations in that river system, and in 2005 Alberta had 11 populations of bull trout considered to be extirpated, or locally extinct, and that number has likely risen. Hopefully that differentiates and makes clear what is meant by a ‘Resident’ Bull Trout, and a ‘Fluvial’ Bull Trout, as these terms will be widely used throughout the rest of the report. This Bull was caught from a small stream in July… But look at the size of that head! This is clearly a mature stream resident Bull. The population charts later in this post confirm a resident population in this particular creek, but it was thought to have less than 50 mature Bulls remaining in 2005. These different populations each face different threats. My own personal inference is that Stream Resident Populations right now are especially vulnerable to the threats posed by anglers, and it is in these populations that, if more widely practiced, C & R and good fish handling will have a pronounced effect on populations recovering . If there are not improvements, many Resident populations could or may have already disappeared. Fluvial Populations are perhaps at slightly less risk then resident populations when it comes to the immediacy of the threat, but much more complex and difficult to solve when it comes to long term solutions. These populations are more susceptible to large scale land usage and environmental degradation, as opposed to angling pressure, and these are threats that will surely carry into the future. All of the threats are discussed next. What are the Threats facing Bull Trout? The reason for Bull Trout populations decreasing across the province can be broken down to 3 main things, according to the SRD Report. 1) Climate Change leading to more seasonal variation, 2) Human Land use leading to environmental degradation, and 3) Fishing Pressure and Fish Harvesting. These are the 3 main factors that effect all our Fish species, however, Bull Trout are the most susceptible to each of these threats than other fish. Why? 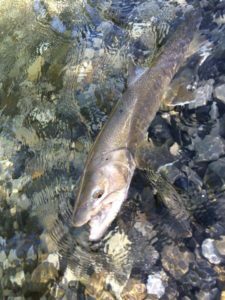 First, unlike Rainbows, Browns, and some other fish that can live in a broader range of conditions and water temps, Bull Trout absolutely need cold, clean water. This means they are more susceptible to things like droughts, low snowpack years, and extreme heat, AKA climate variability, which as we know becomes more of a problem as we deal with the effects of Climate change in the future. The past several years in Alberta have come with droughts, extreme heat, and low water flows. These conditions can have very serious effects on Bull Trout, especially when coupled with angling pressure. Human interference through Forestry, Oil and Gas Development, and farming also affect their habitat by increasing flow rates in the spring (more run-off in spring from farms, clear cuts, roads), which will degrade in stream habitat (less pools, log jams, undercut banks where trout live, more flat boring water without shelter from predators), compromise spawning grounds (silt bottoms from forestry run-off instead of gravel bottoms), and will also lead to lower stream flows in the summer and fall (a natural forest serves to collect and slowly distrubute water throughout the season, a process that is compromised by the above land uses), which will mean warmer in stream temps this time of year. All of these environmental factors have the potential to negatively impact Bull Trout. Fish harvesting is very detrimental to Bull Trout because Bull Trout take a very long time to reach spawning maturity (usually at least 5 years). This means a Bull Trout has a much higher chance of being harvested before it can spawn, compared to something like a Brook Trout, which can reach spawning maturity in as little as one year. That is why Brook Trout reproduce so quickly, and can withstand fish harvesting. This leads into the final threat facing Bull Trout, which is invasive fish species. 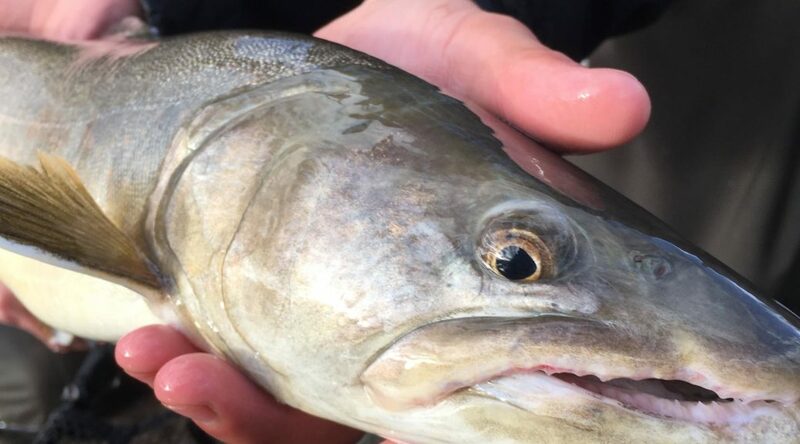 Invasive fish species, like the Brook Trout, but also Brown Trout and Rainbow Trout in Alberta, reproduce faster and out-compete/ over populate native fish, which means there are cases of streams that used to contain Bull Trout that now only have Brook Trout or Brown trout. 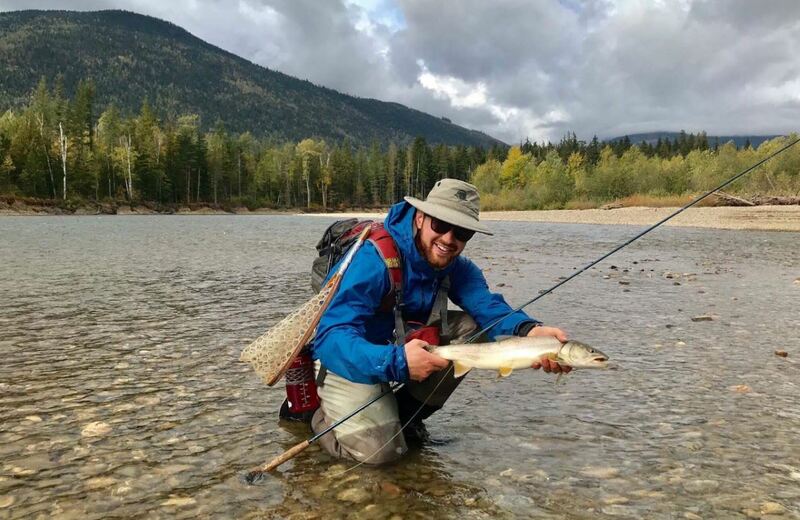 It is important to understand that is is a combination of the above threats leading to the diminishing Bull Trout population, and the threat may be different in each water shed and for each population/ sub-population. Fishing pressure and harvesting is the one threat that we as anglers have the ability to control, therefore it is critically important we do so so we don’t compound the issues created by the other two threats. 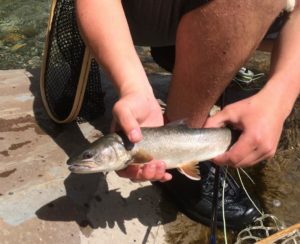 So, time to hit you with the Numbers… How threatened are Bull Trout? This is the part where all the scary statistics come into play. Remember, this data is from 2005… What do you think these stats would be now, 13 years later? The good news is that 66% of core populations were rated as having a ‘Moderate’ to ‘High’ potential for recovery. This map shows the historic range of Bull Trout vs. the Current Range. It also shows the conservation ranking of each watershed. Some may find these numbers alarming. Others may find them underwhelming, something to not be concerned about. Knowing that most of the streams have the potential to recover is encouraging, however, knowing that 78 % are still at risk means we are very, very far from solving the problem. Bull Trout became catch and release in Alberta in 1994, meaning after 10 years of catch and release regulations 61 % of populations were still in decline. However, the 39 % that stabilized or increased largely did so because of C & R regulations, proving that C & R does work and is very important. The SRD report goes on to break down each Core population into population type, population size, population range, the risk rating, the severity of threats, and the population trend. All very interesting stuff if you’re like me and want to know exactly how many fish are in all your Favourite streams. I am not going to share all of that, as your brains might explode, but I will share a few of the core populations, especially those in the popular Bull Trout streams of southern Alberta so that you can see how each is doing. If you want to see every population, check out the SRD report (pg. 26-29). Note* Not all Core Populations within Watershed are listed. I have compiled a few examples from each watershed. The total amount of core populations is listed beside the Watershed name, eg. Oldman (10) , meaning there are 10 total core populations in this drainage. All charts from SRD Report. As you can see, the Upper Oldman and the Upper Livingstone are both listed as ‘Stable’ and have moderate chances of recovery. On the other hand, the Lower Oldman River, Waterton River, Drywood creek, with low chances or recovery, while Willow Creek no longer has a population. This can be strongly attributed to the Oldman Resevoir Dam, which has disconnected the populations below the dam from the more stable populations above the Dam. As is a theme, Resident populations in Small Creeks are all very close to Extirpation, as has already happened in Willow Creek. This is true across all watersheds in Alberta. There is additional info available on the Upper Oldman River Area from a 2009 study, available here Bull Trout Population Assessment in the Upper Oldman River Drainage, 2009 which breaks down each tributary/ potential spawning ground. It concludes that Hidden Creek is a critical spawning ground for Migratory populations of Bull Trout in the Upper Oldman. A few things jump out at me from this one. First, the extremely low population numbers in the Highwood River. Remember, this is data from 2004. To think that there is, or mind you, WAS, a maximum of 250 mature Bulls in that river is astounding, considering the amount of fish it seems like there is. It is not unlikely that population may have significantly rebounded in the past 14 years, and population numbers may be closer to the Populations in the Sheep River. Cause boy, it sure feels like there is more than 250 Bulls in there. Again, Flat Creek, Jumpingpound Creek, Canyon Creek (not listed), are all small creeks with Resident populations in critical shape. Now, I find this graphic the most interesting, for a few reasons. The first being that this is my home watershed in which I guide on, so it hits closer to home. Second, I find it very intriguing that there are only 2 total Core populations in the whole basin, one of them close to Extirpation (if not already extirpated within the last 14 years.) However, again, the trend of smaller streams with a critically low population of resident Bulls is present. In Lorne Fitch’s ‘Two Fish. 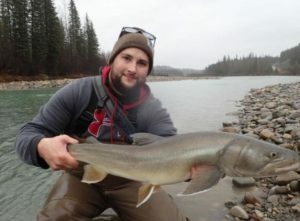 One Fish, No Fish,‘ there is a part that says “In many watersheds, populations of Bull Trout may have disappeared before we even knew they were in there.” I think this is the situation in the Red Deer River system. The waters of the Upper Red Deer River are beautiful Bull Trout waters. An Angler peering into the pools of the Upper James River would be sure there would be Bulls in every one of the plentiful pools, if he didn’t know any better. However, I’ve never caught a Bull up there. And the locals tell me there isnt any fish at all in the Upper James. Why would there be no Resident populations in rivers like the James, or the Panther, the Dormer, or any of the many other small creeks? I find it hard to believe that there was never resident populations. No, I believe these populations were essentially extirpated by the time we started monitoring. The Red Deer River Basin is a good example of the cumulative effects of all the threats listed above. The area has a long history of land use and land exploitation. The Coal Camp road which gives access to the waters of the Upper Red Deer was developed to allow industry into the area. All the way up to the Banff National park border, there is extensive forestry, Oil and Gas development, Cattle Ranching, and heavy recreational use with ATV’s and dirtbikes. It was, and still is, a prominent area for hunting, outfitting and trapping, all activities which brought with them people and fishing pressure. Without a doubt, the Upper Waters of the Red Deer are a shade of what they once were, and fish harvesting was a major contributor. I stumbled upon an excerpt from the book People and Peaks of the Panther River and Eastern Slopes, that really sheds light on this. It is taken from a one-on-one interview from an old-time outfitter in the area. “I remember fishing for Dolly Varden trout, which was something… You could catch bagfuls of them. Most were two-and-a-half to three pounds. They’d spawn and would go up the Little Red and Harrow Creek. Bagfuls of spawning Bull Trout! That left me shaking my head. It’s amazing the extent of the damage done by old timers. This is just one of several stories from this book relating to over-fishing. If someone were to take 100 Bulls from a spawning ground these days, they could be taking 40-50 % of the total population. And back then, it was considered the norm. No wonder they disappeared. However, I believe if more research was done it would be found that there are resident populations still hanging on in the Panther River and other tributaries. Why do I say this? Well, there is a pool, about 10 minute walk from the Lodge at Panther River. In this pool is a huge Bull Trout. This Bull Trout was there in late April. He was there in early July. He was there in October during the Bull Trout Spawn. He has much more color than the average Bull in the Panther, a much more Olive Color. While many of the smaller, 16″-22″ Bulls seemed to disappear and move around as the season moved on, this Bull Trout was always in the same spot. If part of a Fluvial Red Deer River population, wouldn’t this unmistakable Bull be on the move, at some point in the season? Who knows. All I know is that in the past, before we came, and exploited, there was probably a Bull like him in each and every pool. Now, they are few, and far between. So, that leads us into the most important part of this post. What can you do as an angler??? The above info is more to give people a snapshot of what is going on out there in our streams, and to learn a bit more about Bull Trout. What is really important, however, is that we take that and do everything we can to mitigate, and eventually eliminate the threats caused by angling pressure. I have organized this framework into four key components. Srictly adhere to C & R and bait ban regulations. This one is first because it is vitally important and there is simply no excuse for not knowing the regulations. Get it out of your heads. Bull Trout are not for keeping. And using bait is harmful for fish. Know how to identify Bulls, and safely release them. Use single, barbless hooks (pinch your barbs), and use proper fish handling techniques. This can not be over-stated. How we treat our fish and remove the hooks can be the difference between life and death in some cases. Any angler targeting Bulls must be familiar with how to safely release a fish once caught. Having pinched barbs will greatly aide you in this process, as the hook will pop out easily. Proper fish handling includes: not playing the fish longer than necessary, keeping the fish wet whenever possible, wetting your hands before touching fish, avoid over handling of the fish, do not touch the gills/gill plate, holding fish under the belly and not by the jaw, and allowing fish to recover energy before releasing it (by facing it into the current and letting it swim away when ready). This fish need water poster is a great framework for proper fish handling! Proper fish handling is particularly important when stream temperatures are warmer than normal, from extreme heat, drought, or low water levels, all of which will warm water and decrease dissolved oxygen. In many cases, a fish may be handled poorly and swim away, seemingly fine after being released; however, many of these fish will die after being released, due to damaged organs, loss of blood, or from not being able to recover their oxygen levels. During times of heat and high water temps, all fish need to be thoroughly revived in the coldest, fastest moving water before being released. 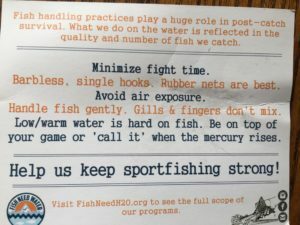 Or even better, avoid fishing at all. Use a proper 6-8wt setup and strong Tippet. This one is a pet peeve of mine. Don’t go out fishing with a 3-5wt glass rod if you know you are targeting Big Bulls. 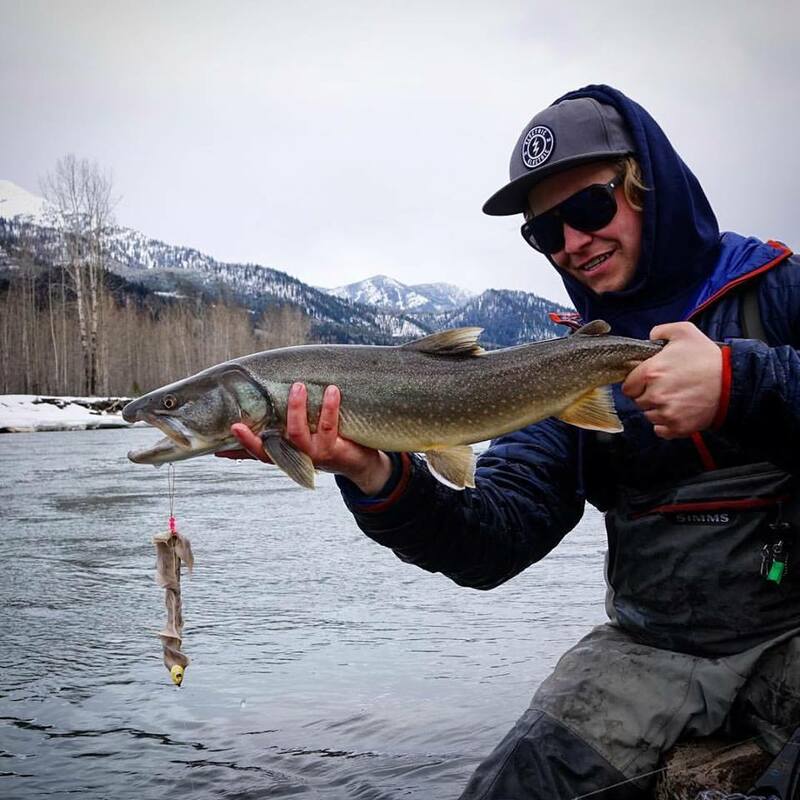 Your instagram photo with your Rod completely bent over (#GetBent) might look really cool, but the results for those Bull Trout could be quite the opposite. A Big Bull can be quite hefty and usually takes some wrangling to convince it to move from the bottom. It takes far to long to play and net a large bull if using a lightweight set-up, which will completely drain the fish of all its energy. If improperly handled, or the water is warm, it will almost certainly die. So don’t do it. Get a proper set-up. Do not fish tributary streams during Bull Trout spawn (usually September- October), and avoid targeting Bulls during this time. Spawning is rigorous work for a trout, and fishing pressure during this time can lead the death of many mature, spawning aged fish, critical for maintaining the population. This one is important to reinforce because most streams remain open during the Bull Trout Spawn. It is up to you to as an angler to take ownership and be aware of and avoid small streams if possible. And if you do find yourself fishing a likely Bull Trout spawning ground, do not use streamer patterns or target Bulls, be cognizant of where you are wading and be sure to avoid redds. 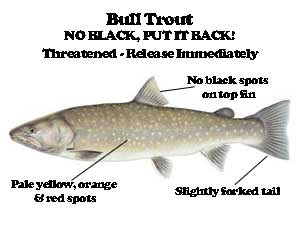 If you accidentally hook a Bull Trout, be extra diligent with the safe handling techniques listed above. If you see people fishing these streams from September- seasons close, kindly remind these people of Bull Trout spawn and recommend they fish elsewhere. On top of all of that, the last thing you can do is educate others who might not know the above practices, and raise awareness for the Bull Trout every opportunity you get. Maybe that is by sharing this post with your friends (highly reccomended! ), refreshing your memory by chatting with your buds on the drive out for day you plan to fish for Bulls, or maybe its kindly checking in on that fisherman with a spin rod and a cooler, and make sure he’s using the cooler for beer, and not Bulls. And maybe check to be sure he ain’t using a triple barbed hook, or chucking bait, or fryin’ em up on the BBQ. Cause frankly, there ain’t enough for all of us! So what do you think? 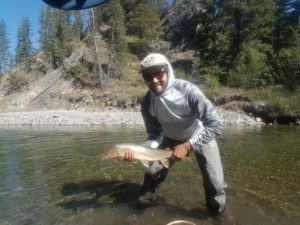 Do Bull Trout in Alberta have a bright future? Have populations rebounded significantly in the past 14 years? Are people starting to get it? Is there something I missed, or haven’t considered? This post was born of my own passion for Trout Fishing and conservation; and I have taken great pride in putting it together. But by no means do I consider myself an expert. There are countless anglers in Alberta who have much more experience then I do, over a longer period of time, with many more Bull Trout to their name then I do. So please, comment with your thoughts, email me if you want to chat further or would like more info, or message me on Facebook. If you enjoyed, PLEASE SHARE!! Lets start a conversation! As a community, let pull through for Bull Trout. That concludes part one of the series, ‘State of our Trout.’ I sincerely thank everyone who took the time to read through, I hope you enjoyed learning about the Bull Trout and have found value in this post, regardless of how experienced of an angler you are. Next in the series we will take a closer look at another Native Trout, and my favourite sportfish, the Westslope Cutthroat Trout! Stay Tuned. Great Article Kevin very informative and well researched. Looking forward to the next one! Great article! This information is detrimental and needs to get out there. It pains me to see the amount of “fishermen” who can’t recognize trout species and even more cringeworthy, poor fish handling techniques. I’ve shared this article with all my friends and am a true supporter of protecting the beautiful Bull trout here in Alberta. I would really love to share a photo with you of my trophy bull bucket list fish i caught 2 weeks ago. Respond to this message via my email (derek.nijhuis@gmail.com) and I will give you the info on where is was caught as well. Amazing info. This blog provided a very good information. I did not know anything about it before. I learned a lot about reading your blog. I am very happy to know that you have researched about it. Thanks for sharing this great blog.